SeeClickFix wants to thank all of the people from the WeMedia Conference, WeMedia, Ashoka, Ethics and Excellence Journalism Foundation and the judges( John McKinley, Greg McHale, Limor Schafman, and Rusty Lewis) that supported us. The feedback, insight, advice, bug testing (you know who you are), tweeting, blogging and of course clicking has pushed SeeClickFix another step forward. We are certain that the $25,000 Prize that was awarded will spread SeeClickFix into many many more communities. 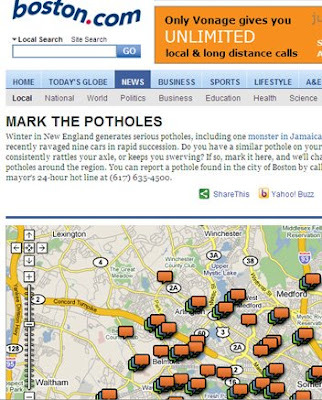 The Boston Globe ran a front page story yesterday on Boston.com about potholes and linked to the SeeClickFix Map they have embedded on their site. There were around 100 potholes reported on SeeClickFix in Western Mass. yesterday and a whole lot more activity in the feeds including a few watch areas created for local officials in Mass. If you are a newspaper or a blog or know someone that runs one, please contact us: team@seeclickfix.com if you would like a SeeClickFix map in your site or just generate the source code from our generate widget button after you create a watch area. SeeClickFix is going to Miami as finalist in the WeMedia 09 Pitchit Competition.